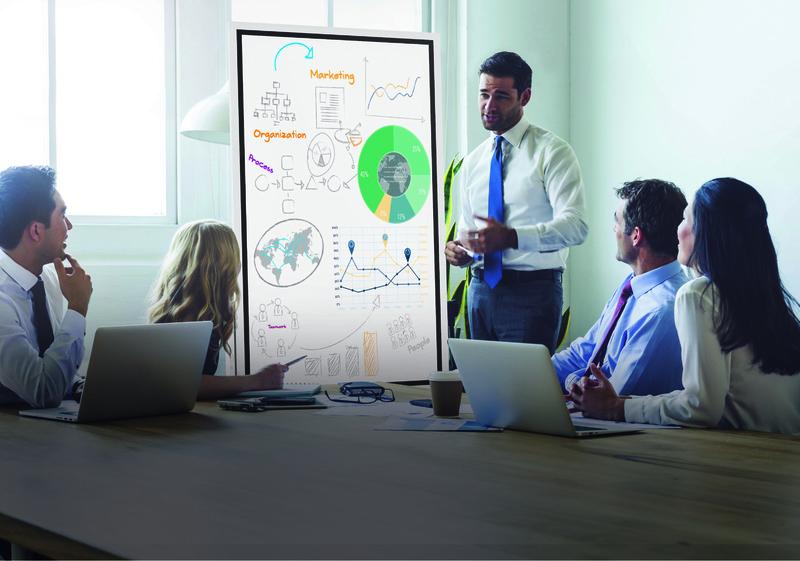 The Samsung Flip is an innovative digital flipchart that helps to drive more productive and efficient collaboration without the hassle. With the Samsung Flip interactive UHD display, your team can work smarter, faster and better. Business meetings can take place anywhere, anytime, and you can take the stress out of the logistics. Just like paper flipcharts on easels, the Samsung Flip has a stand and wheels, making it easy to move around offices or hotel meeting room spaces. Walk up to Flip and it just turns on, identifying someone’s presence with an embedded smart sensor, letting attendees dive right into meeting content. Flip’s display works in traditional flipchart orientation, or can be pivoted to sit in landscape mode when the ideas and illustrations in a meeting need a wider format. Flip also tilts back 4.5 degrees to allow for more natural writing. Flip has embedded computing power and is web-connected, making fully synchronized collaboration possible in meetings. People who bring a laptop, tablet or smartphone can mirror their screens to share content with the group. Flip can drive digital presentations. Imagine walking the team through a presentation deck, then pivoting Flip into portrait mode to develop notes and gather real-time feedback. Meeting notes all get captured and housed in a central database. Digging up what came out of last week’s product roadmap meeting is just a keyword search away. Notes from a meeting can be recapped and shared straight from Flip, using built-in email, distributed over the network or saved to USB storage. When you work with HB, you get an experienced team that has the drive and capabilities to make collaboration what it should be in your organization – easy and adoptable. Learn more about HB Communications, Inc.